Macro photography promises fun, unique ways of capturing the things that amaze you most, whether it's the petal of a flower, the eye of an insect or the tiny toes of a newborn baby. The AF-S DX Micro NIKKOR 40mm f/2.8G provides high resolution and contrast from infinity to life-size (1X) so that you can focus extra close on your subjects, allowing you to get lost in the tiny details of life. This standard close-up lens captures the finest details at any distance, including details practically impossible to detect with the human eye (at 1X magnification). It's a great choice for enticing food photography or detailed product shots. And with its continuous autofocusing from infinity to 6.4 inches (life-size/1X), the AF-S DX Micro-NIKKOR 40mm f/2.8G ensures sharpness and clarity in every composition. Whether you're shooting portraits, food or nature—indoors or outdoors—the AF-S DX Micro-NIKKOR 40mm f/2.8G's rounded 7-blade diaphragm renders a beautiful, natural background blur (Bokeh) at its wider aperture settings. Selective focus helps to isolate the subject, creating out of focus backgrounds. Stunning portraits and landscapes, too! 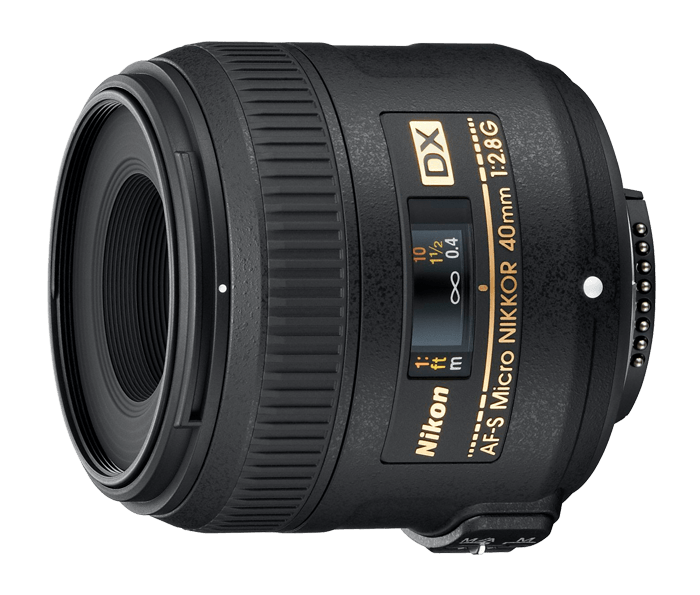 The AF-S DX Micro-NIKKOR 40mm f/2.8G is compact, lightweight and versatile enough for everyday photography, including flattering people shots and breathtaking landscapes, so you get brilliant results in most situations without switching lenses. The AF-S DX Micro NIKKOR 40mm f/2.8G is excellent at capturing natural surroundings as well as using it for super close-ups. Its ability to render fine detail make this a standout for landscape work.